Ben Clifton is not only excelling as a skilled defender at the Coburg Lions but also leaving his mark as a respected and admired leader. Ben’s journey with football in my opinion is admirable, finding the love of the game at 10 years of age and years later not only playing the game he loves but also having a pivotal role in shaping the younger boys, through being part of the leadership group and vice-captain. “Being both the vice-captain as well as part of the leadership group, I feel really privileged and honored. To lead the younger boys the best way I can and to always show my support, it’s important. “I want to be the best I can be, play the highest level of football and being a defender just comes naturally”. Like many leaders within a football club, the importance of being the ultimate role model for the younger boys just starting out is important, to ensure the younger boys are always aware that support is a constant factor; Coburg Lions is definitely no different. Ben is extremely appreciative of the chance to not only play VFL football but to be able to guide the younger boys, they’re opportunities Ben doesn’t take lightly. “The younger boys bring excitement, they’re definitely examples of what’s to come for the club. To play the game I love as well as to guide the younger boys is something I love doing and I can one day see myself coaching football, that’ll be great”. Whilst chatting with Ben, I was already aware of his skills as a defender, the respect and admiration he has from both the older/younger boys but wasn’t aware of his ambition to one day coach. I can definitely see Ben being a great coach and I can definitely put forward that I will not be the only one that has belief in Ben, it’s quite fitting as Ben finishes his degree to be a teacher in short six months. “It’s football for awhile but hoping coaching is my standstill with football, hopefully”. 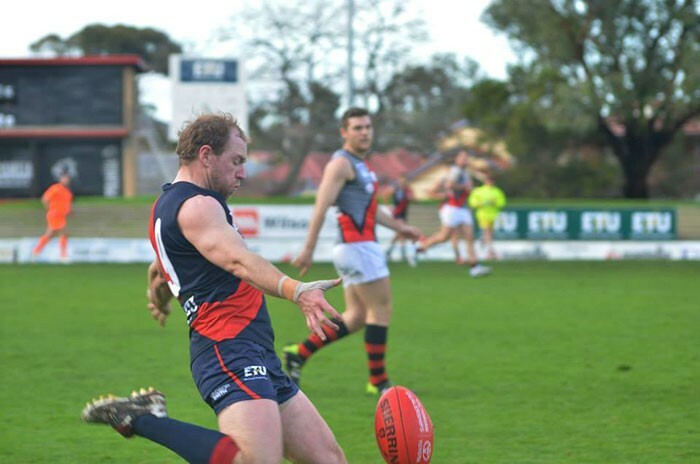 Like all the supporters, players and coaching staff a definite highlight for all would be exceeding the expectations of many in regards to how well Coburg was going to perform this year. Ben is confident in not only himself in producing his best work but also Coburg Lions as a team, through hard work and belief, they’ll one day be on top. “Being the underdogs each week pushes us to perform, we all have a strong sense of mate-ship and trust within one another which enables us to perform the way we do. There’s definitely more to come from the boys and we’re definitely going to get better”. Coburg’s been home to Ben for many years and he’s excited to see where his journey with football will lead. Ben is most definitely a fantastic defender, leader and vice-captain. Playing VFL football is a privilege but forming real friendships with the boys is an added bonus. I can see Ben playing football professionally as he oozes both skill and mindset to be a great professional footballer, but I can also see Ben excelling as an incredible coach.